Unlike receptors with intrinsic kinase activity in their intracellular domains or in direct association with intracellular enzymes, members of the tumor necrosis factor (TNF) receptor superfamily and the interleukin-1 (IL-1) receptor/ Toll-like receptor (IL-1R/TLR) superfamily use adapter proteins to couple to enzymatic activation and signal amplification. The TNF-receptor-associated factors (TRAFs), which currently consist of six members (TRAF1-6) in mammals [1-8], have emerged to be the major adapter proteins for these receptors. Through versatile protein-protein interactions, TRAFs link receptor activation to downstream kinase activation and eventually the stimulation of nuclear factor kB (NF-kB) and AP-1 transcriptional activity. Collectively, a wide range of cellular effects including cell survival, proliferation, and differentiation may be elicited by TRAF signaling. The TRAFs participate in receptor signal transduction by either direct association with receptors or indirect interaction through additional adapter proteins, in at least three distinct pathways (Fig. 1). Members of the TNF receptor superfamily that do not contain intracellular death domains, such as TNF-R2 and CD40, recruit TRAFs directly via short sequences in their intracellular tails [1,2,5,7]. The Epstein-Barr virus transforming protein LMP1 has also been shown to directly recruit TRAFs for viral survival and cell transformation . Receptors that contain an intracellular death domain, such as TNF-R1, first recruit an adapter protein TRADD via a death domain-death domain interaction . TRADD then serves as a central platform of the TNF-R1 signaling complex, which assembles TRAF2  and RIP [11,12] for survival signaling and Fas-associated death domain (FADD) and caspase-8 for inducing apoptosis [10,13]. Members of the IL-1R/TLR superfamily contain a protein interaction module known as the TIR domain, which recruits sequentially MyD88 , a TIR-domain- and death-domain-containing protein, and IRAK , an adapter Ser/Thr kinase with a death domain. Oligomerization of IRAK appears to result in its association with intracellular TRAF6 to elicit signaling . Members of the TRAF family are characterized by the presence of a novel TRAF domain at the C terminus which in turn consists of a coiled-coil domain followed by a conserved TRAF-C domain 1 (Fig. 2). The TRAF domain plays an important role in TRAF function by mediating self-association, receptor interaction, and interactions with other signaling proteins such as TRADD and IRAK [8,10,16]. The N-terminal portion of most of the TRAF proteins contains a RING finger and several (five to seven) zinc finger motifs, which is important for downstream signaling events [16,17]. The presence of TRAFs is conserved genetically in other multi-cellular organisms such as Drosophila , Caenorhabditis elegans , and Dictyostelium discoideum . Crystal structures and biochemical characterizations have revealed a conserved trimeric association of TRAFs that is mediated by both the coiled-coil domain and the TRAF-C domain (Fig. 3 A) [20-22]. This trimeric stoichiometry of TRAFs provides a structural basis for the signal transduc-tion across the cellular membrane after receptor trimeriza-tion by trimeric extracellular ligands in the tumor necrosis factor (TNF) superfamily . Interestingly, recent studies suggest that specific ligand-induced receptor trimerization may be primed by nonsignaling receptor preassociation prior to ligand binding . Thermodynamic characterization reveals the low-affinity nature of monomeric TRAF2-receptor interactions, thereby confirming the importance of oligomerization-based affinity enhancement or avidity in receptor-mediated TRAF recruitment . Figure 1 Membrane-proximal events in TRAF signaling, showing direct and indirect TRAF recruitment to post-receptor signaling complexes. Figure 2 Domain organization of TRAFs. 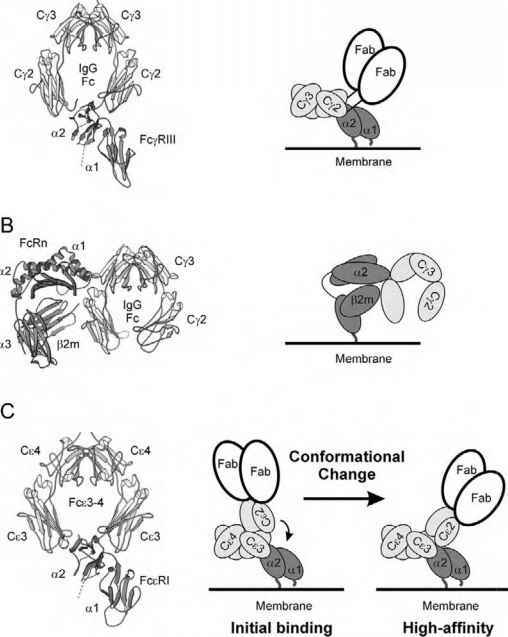 Receptor sequences bind symmetrically to the surface groove on the TRAF-C domain of TRAF2 in an extended conformation (Fig. 3A) [20,22]. It makes main-chain hydrogen bonding interactions with the edge of the P-sandwich structure of the TRAF-C domain. Specific side-chain interactions observed in multiple TRAF2-receptor complexes have led to the establishment of short TRAF2-binding motifs . Residues on the TRAF2 surface used for receptor interaction is generally conserved in TRAFs 1, 3, and 5, suggesting that these TRAFs interact with similar receptor sequences. However, a somewhat different binding mode has been observed for the interaction of TRAF3 with the same sequence from CD40, which forms a hairpin on the TRAF3 surface . The mode of TRAF2 recruitment by TRADD has been revealed by the crystal structure of the TRAF2-TRADD complex (Fig. 3B) . The more extensive TRAF2-TRADD interface overlaps spatially and therefore potentially competes with TRAF2-receptor-peptide interactions. Biochemical characterization of the interaction has shown that TRAF2 has a significantly higher affinity for TRADD than for the peptide motifs in direct receptor interactions, which leads to more efficient initiation of TRAF2 signaling by TRADD. In addition, TRADD interacts with only TRAF1 and TRAF2, but not other members of the TRAF family. It appears that TRAF1 and TRAF2 work in conjunction with associated caspase inhibitors, cIAP-1 and cIAP-2, to fully suppress TNF-induced apoptosis in the TNF-R1 signaling complex [28,29]. This leads to a dominance of survival signaling for TNF-R1 under most circumstances. Figure 3 TRAF structures. (A) Mushroom-shaped trimeric structure of the TRAF domain of TRAF2 in complex with TNF-R2 , shown with the three-fold axis vertical. The coiled-coil region (stalk) is in yellow. The P-strands of the three TRAF-C domains are shown, respectively, in blue, green, and purple. Bound peptides from TNF-R2 are shown as orange arrows indicating the direction of the peptide chains. (B) Ribbon diagram of the complex between TRADD and TRAF2 , shown with the three-fold axis vertical. TRAF2: blue, green, and purple; TRADD: magenta, red, and yellow. proximity of kinases and other signaling proteins. Because many different receptors recruit the same TRAFs, the availability of intracellular TRAFs can be a limiting factor in TRAF-mediated signal transduction. It has been shown that receptor activation can lead to depletion of the cytoplasmic pool of TRAF2 via relocalization to insoluble fractions  and/or TRAF degradation [35,36]. This suggests a competitive nature of TRAF signaling by different receptors and adds to the potential complexity of TRAF-mediated signal regulation. 1. Rothe, M., Wong, S. C., Henzel, W. J., and Goeddel, D. V. (1994). A novel family of putative signal transducers associated with the cytoplasmic domain of the 75 kDa tumor necrosis factor receptor. Cell 78, 681-692. 2. Cheng, G. et al. (1995). Involvement of CRAF1, a relative of TRAF, in CD40 signaling. Science 267, 1494-1498. 3. Mosialos, G. et al. (1995). The Epstein-Barr virus transforming protein LMP1 engages signaling proteins for the tumor necrosis factor receptor family. Cell 80, 389-399. 4. Regnier, C. H. et al. (1995). Presence of a new conserved domain in CART1, a novel member of the tumor necrosis factor receptor-associated protein family, which is expressed in breast carcinoma. J. Biol. Chem. 270, 25715-25721. 5. Ishida, T. K. et al. (1996). TRAF5, a novel tumor necrosis factor receptor-associated factor family protein, mediates CD40 signaling. Proc. Natl. Acad. Sci. USA 93, 9437-9442. 6. Nakano, H. et al. (1996). TRAF5, an activator of NF-kB and putative signal transducer for the lymphotoxin-ß receptor. J. Biol. Chem. 271, 14661-14664. 7. Ishida, T. et al. (1996). Identification of TRAF6, a novel tumor necrosis factor receptor-associated factor protein that mediates signaling from an amino-terminal domain of the CD40 cytoplasmic region. J. Biol. Chem. 271, 28745-28748. 8. Cao, Z., Xiong, J., Takeuchi, M., Kurama, T., and Goeddel, D. V. (1996). TRAF6 is a signal transducer for interleukin-1. Nature 383, 443-446. 9. Hsu, H., Xiong, J., and Goeddel, D. V. (1995). The TNF receptor 1-associated protein TRADD signals cell death and NF-kB activation. Cell 81, 495-504. 10. Hsu, H., Shu, H.-B., Pan, M.-G., and Goeddel, D. V. (1996). TRADD-TRAF2 and TRADD-FADD interactions define two distinct TNF receptor 1 signal transduction pathways. Cell 84, 299-308. 11. Hsu, H., Huang, J., Shu, H. B., Baichwal, V., and Goeddel, D. V. (1996). TNF-dependent recruitment of the protein kinase RIP to the TNF receptor-1 signaling complex. Immunity 4, 387-396. 12. Stanger, B. Z., Leder, P., Lee, T., Kim, E., and Seed, B. (1995). RIP: a novel protein containing a death domain that interacts with Fas/APO-1 (CD95) in yeast and causes cell death. Cell 81, 513-523. 13. Muzio, M. et al. (1996). FLICE, a novel FADD-homologous ICE/CED-3-like protease, is recruited to the CD95 (Fas/APO-1) death-inducing signaling complex. Cell 85, 817-827. 14. Wesche, H., Henzel, W. J., Shillinglaw, W., Li, S., and Cao, Z. (1997). MyD88: an adapter that recruits IRAK to the IL-1 receptor complex. Immunity 7, 837-847. 15. Cao, Z., Henzel, W. J., and Gao, X. (1996). IRAK: a kinase associated with the interleukin-1 receptor. Science 271, 1128-1131. 16. Takeuchi, M., Rothe, M., and Goeddel, D. V. (1996). Anatomy of TRAF2. Distinct domains for nuclear factor-KB activation and association with tumor necrosis factor signaling proteins. J. Biol. Chem. 271, 19935-19942. 17. Rothe, M., Sarma, V., Dixit, V. M., and Goeddel, D. V. (1995). 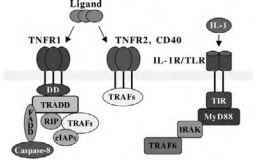 TRAF2-mediated activation of NF-kB by TNF receptor 2 and CD40. Science 269, 1424-1427. 18. Liu, H., Su, Y. C., Becker, E., Treisman, J., and Skolnik, E. Y. (1999). A Drosophila TNF-receptor-associated factor (TRAF) binds the ste20 kinase Misshapen and activates Jun kinase. Curr. Biol. 9, 101-104. 19. 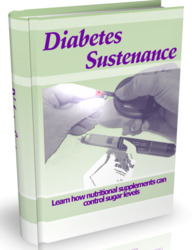 Wajant, H., Muhlenbeck, F., and Scheurich, P. (1998). Identification of a TRAF (TNF receptor-associated factor) gene in Caenorhabditis elegans. J. Mol. Evol. 47, 656-662. 20. Park, Y. C., Burkitt, V., Villa, A. R., Tong, L., and Wu, H. (1999). Structural basis for self-association and receptor recognition of human TRAF2. Nature 398, 533-538. 21. Pullen, S. S. et al. (1999). High-affinity interactions of tumor necrosis factor receptor-associated factors (TRAFs) and CD40 require TRAF trimerization and CD40 multimerization. Biochemistry 38, 10168-10177. 22. McWhirter, S. M. et al. (1999). Crystallographic analysis of CD40 recognition and signaling by human TRAF2. Proc. Natl. Acad. Sci. USA 96, 8408-8413. 23. Banner, D. W. et al. (1993). 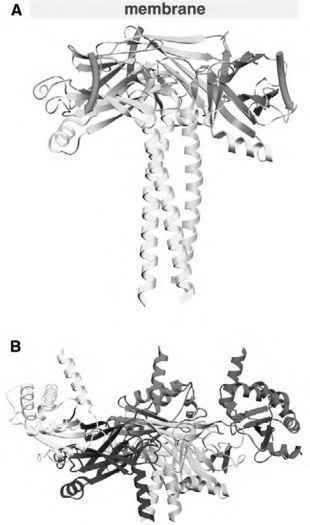 Crystal structure of the soluble human 55 kd TNF receptor-human TNF beta complex: implications for TNF receptor activation. Cell 73, 431-445. 24. Chan, F. K. et al. (2000). A domain in TNF receptors that mediates ligand-independent receptor assembly and signaling. Science 288, 2351-2354. 25. Ye, H. and Wu, H. (2000). Thermodynamic characterization of the interaction between TRAF2 and receptor peptides by isothermal titration calorimetry. PNAS 97, 8961-8966. 26. Ye, H., Park, Y. C., Kreishman, M., Kieff, E., and Wu, H. (1999). The structural basis for the recognition of diverse receptor sequences by TRAF2. Mol. Cell. 4, 321-330. 27. Ni, C. Z. et al. (2000). Molecular basis for CD40 signaling mediated by TRAF3. Proc. Natl. Acad. Sci. USA 97, 10395-10399. 28. Park, Y. C. et al. (2000). A novel mechanism of TRAF signaling revealed by structural and functional analyses of the TRADD-TRAF2 interaction. Cell 101, 777-787. 29. Wang, C. Y., Mayo, M. W., Korneluk, R. G., Goeddel, D. V., and Baldwin, Jr., A. S., (1998). NF-kB antiapoptosis: induction of TRAF1 and TRAF2 and c-IAP1 and c-IAP2 to suppress caspase-8 activation. Science 281, 1680-1683. 30. Kuhne, M. R. et al. (1997). Assembly and regulation of the CD40 receptor complex in human B cells. J. Exp. Med. 186, 337-342. 31. Hostager, B. S., Catlett, I. M., and Bishop, G. A. (2000). Recruitment of CD40 and tumor necrosis factor receptor-associated factors 2 and 3 to membrane microdomains during CD40 signaling. J. Biol. Chem. 275, 15392-15398. 32. Vidalain, P. O. et al. (2000). CD40 signaling in human dendritic cells is initiated within membrane rafts. EMBO J. 19, 3304-3313. 33. Dadgostar, H. and Cheng, G. (2000). Membrane localization of TRAF 3 enables JNK activation. J. Biol. Chem. 275, 2539-2544. 34. Arch, R. H., Gedrich, R. W., and Thompson, C. B. (2000). Translocation of TRAF proteins regulates apoptotic threshold of cells. Biochem. Biophys. Res. Commun. 272, 936-945. 35. Brown, K. D., Hostager, B. S., and Bishop, G. A. (2001). Differential signaling and tumor necrosis factor receptor-associated factor (TRAF) degradation mediated by CD40 and the Epstein-Barr virus oncoprotein latent membrane protein 1 (LMP1). J. Exp. Med. 193, 943-954. 36. Duckett, C. S. and Thompson, C. B. (1997). CD30-dependent degradation of TRAF2: implications for negative regulation of TRAF signaling and the control of cell survival. Genes Dev. 11, 2810-2821.